Anyways I built another collector mainly to test against my finned absorber collector but since it is a true back pass I thought I'd post my first test here, (well second but the first did not really have much sun). The sun was so good today I took some comp time combined with my lunch and came home for a quick test. I set up the finned collector next to the back pass here, outside temp -7 degrees F.
I did not notice during testing but look at the condensation? on the lower part of the panels were the inlet air is. The back pass excelled in this test with a 5-6 degree higher output right from the start and tracked that way till the end about 30 minutes later. The screen back pass on the right looks better, is lighter at 23 pounds though the other one is no more than thirty five. and seems to work better. I got a max out of the back pass at 102 and 98 with the finned collector. With -7 in both seem to be doing pretty good. But the big kicker was when I went to measure airflow. The finned collector flow ran from .9 to 1.5 out of the 6 inch adaptor but the back pass had a solid 2 mph and up to 2.5 all across the vent. That calculates to almost three times the flow and it had the higher output. But that is 109 versus 103 total gain so it's a pretty small difference and selective placement of the temp probes could possibly null it out. Still there's the flow difference! Looks like your added comp time was well worth it! Thanks for the test report ! They look very neat, standing there side by side in the sun ! Yes the comparison needs to be done but I'm not quite ready yet. I kind of need to understand what I got first as I was thinking about it and while it seems to be working I am not really sure why. 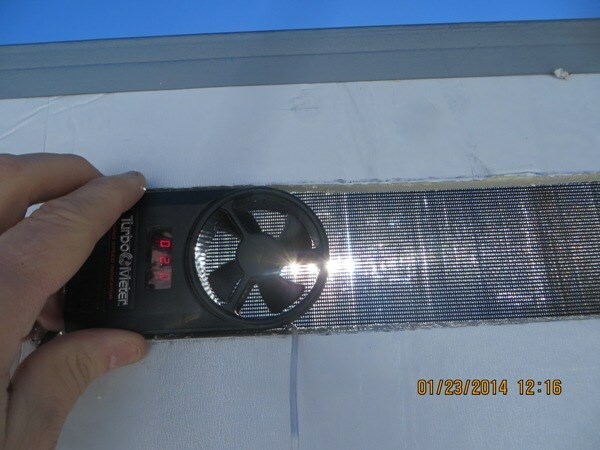 I say this because of some test I did last winter with solar screen. Check out this second post from my experimenting with a screen collector. What I found there was the solar screen really does absorb the heat, 70 degrees for one layer of screen 156 for a layer of solar screen. That part was good because it got hot and it flowed air up and through it. Because it was longer and maybe because the air flowed through it, it really produced the heat. But when I measured under the solar screen the heat dropped 100 degrees. This is my issue now.... If I am just flowing air behind it and I already know the air behind it is much cooler then how is this working? 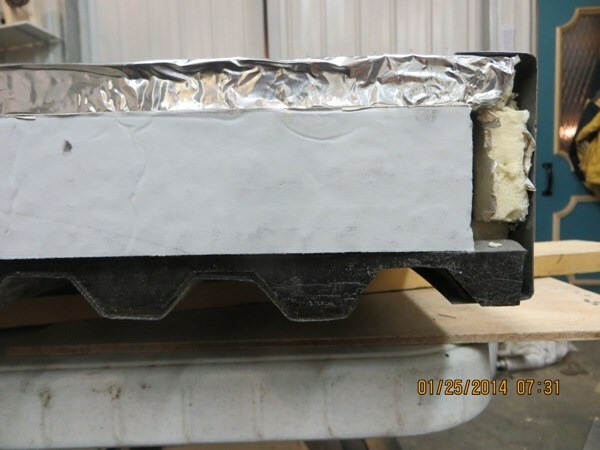 One reason may be when I measured before, the air was not flowing plus maybe the light was not as hot as the sunlight and without flow and a couple of inches away the heat was not transferring to the back where I measured.. In this case I have a much bigger and wider section and the back is at most 1 1/4 inches away. Air is flowing up this channel and scrubbing the heat from the dense screen. The narrow channel between the screen and the back forces a lot of contact with the screen. I am really curious and suspect it is getting through the screen some and coming back through at the exit. The next thing is to force a little air in front so it's a dual pass instead of a back pass but I do not want to go there yet and though I am pretty sure it would be better it would be harder to recover from if it is not. Maybe I can just un staple the top and bottom and fold the screen over about 2 inches on both ends for a test. I feel that my finned collector can be the "standard" until I figure out what works best then I will start modifying that and comparing that against my best screen collector. Then I'll have to move again because it is not a Backpass collector. By the way Hermit, good tune, it's been a while since I heard it. Since I had such a hard time slipping the back on and getting the end on I trimmed the side polyiso pieces and took a sander to my wooden frame to round of the edges and make everything slip together better. This time it slipped together much better and I took a photo of how everything fit together on the end before I put the end cap on. I then slip the end cap in and it gets about to the glazing I have to push it up and insert the bottom wiggle strip between the glazing and the end cap. This also was pretty easy this time. 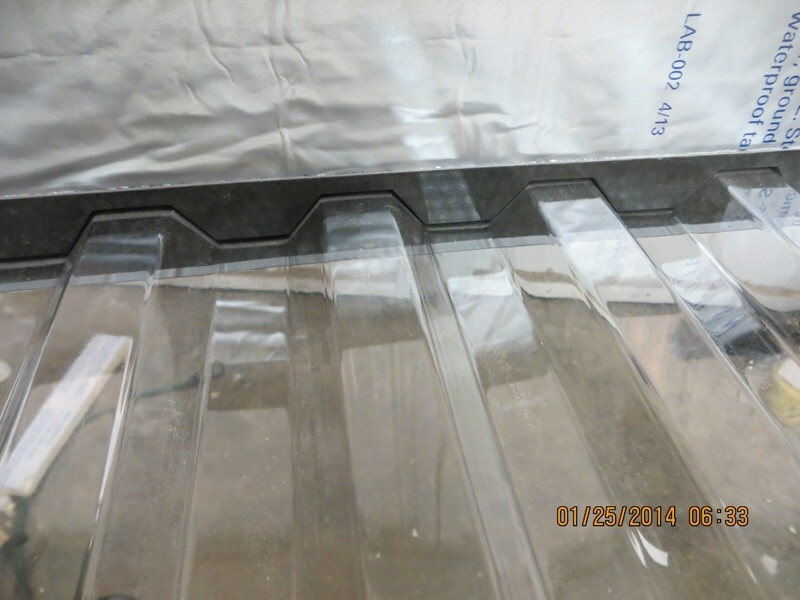 Here is the glazing and wiggle strip from the inside. The Sun is coming up and we should have a good day so I'll find out shortly if there is any improvement. Right now things aren't making sense, I set up the finned collector for comparison, the wind promptly blew it over also. tied them both down and gave it fifteen minutes. The finned collector just does not want to come up to temp and so far has maxxed out at 86 degrees. The screen collector is running 118 degrees standing right next to it. Today for some reason the finned collector has more flow, running about 2.5 MPH and the screen is slightly less than 2 MPH. Outside air is -5 with a "wind chill advisory" of about -25. Not very nice, good thing there is lots of sun. Finned collector has done better, it got up to 103 at 12:15 but the screened collector was at 123. Both are "naturally" flowing at a little over 2 MPH with the outside, (and input), air at 0 degrees F.
Relocated for better sun and checked temps again and they both are up pretty good. 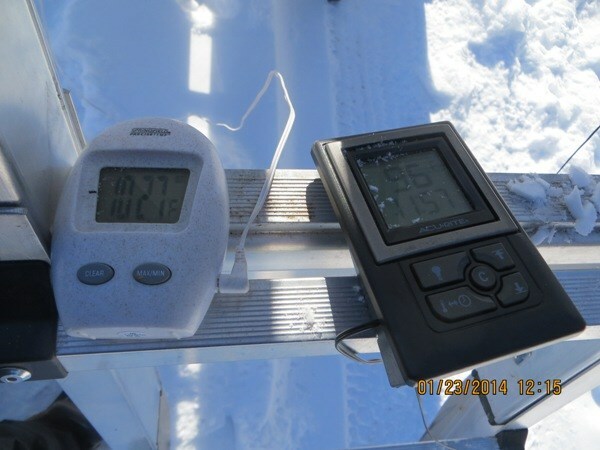 The finned collector topped out at 119 but the screen collector topped out at 138 F. The other day the difference was generally about 5 degrees, today it's been twenty degrees less with the dual pass mod. I can't really complain about either collector but since it performed better and took less than 1/4 of the time, and a lot less thought and energy, I think the screen wins in both configurations. tough call now, should I build a two screen cartridge and compare that to the finned collector or just scrap the finned for now and build a two layer to compete with this dual pass? A few post back you made a comment about backpasses being too restrictive. I feel they have gotten a bad rap both here and on Build it solar. While I agree their version of a backpass had too much resistance, I feel that was primarily due to the fact that the baffles restricted too much flow. With the 1 inch deep flow area and the baffles restricting it down to 12 inches or so this really did restrict the flow area much more than any other design they used. I think Gary mentions that smaller baffles may have helped but I thing another 1/2 depth would have helped also. I like at least a 6" circle duct for a 4X8 panel so at least 27 square inches of flow area where they had 12. 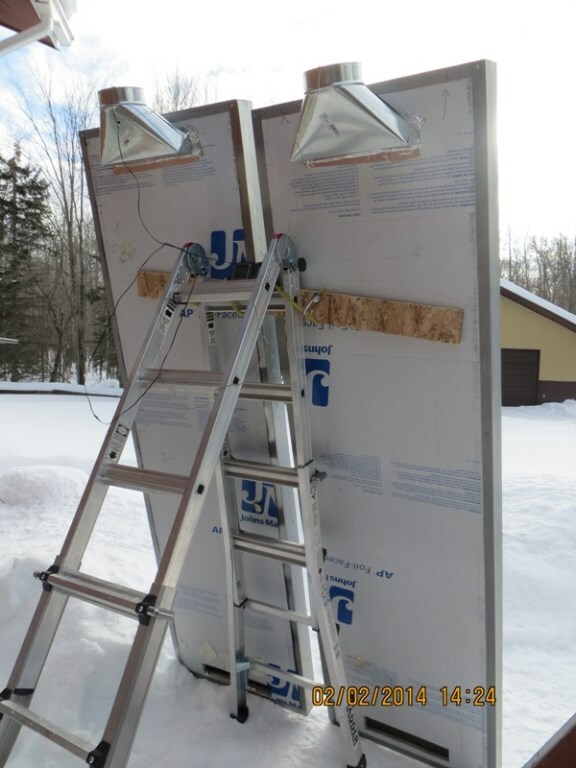 The backpass I just built had at least 32 inches of flow behind the backpass and that panel was only a 2X8 and I think it was restricted very little, (no baffles), and still works real well. Many commercial panels use the backpass design which of course does not mean it is best but they have designed and tested these and feel they have a pretty good design. The other day I found a drawing the guys at Rimstar.com had that claimed a backpass produced a higher output than a matrix, their name for a screen collector). I'm not making that claim but feel we should not be so quick to dismiss this type of collector. I still like what those guys in your pdf were saying about their version of a dual pass with fins. 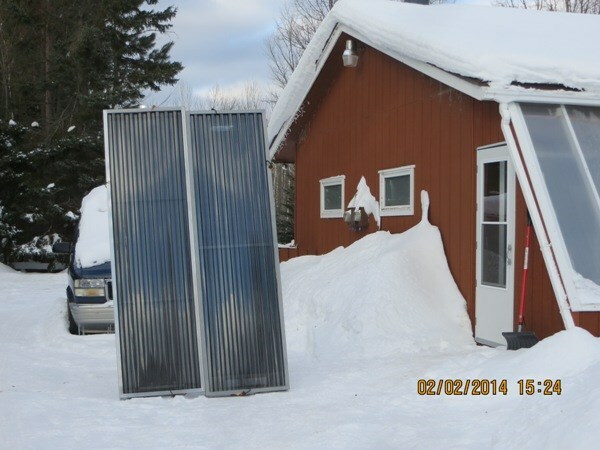 I think that is a great idea as it forms a natural cold air trap, and according to them is really efficient at higher flows but most would be at their flow rates, they use 4 cfm per square foot. Probably more efficient but puts out fairly cool air. I then dismantled the finned collector and frame and made it so my backpass, and 2 layer, cartridge will fit in it and resurrected the backpass. Unfortunately while getting test parts the sun went away and stayed away most of the day. I did get some clearing about two so I ran out and set them up for some quick test. One of the more interesting things was just how fast the two layer screen would heat up. 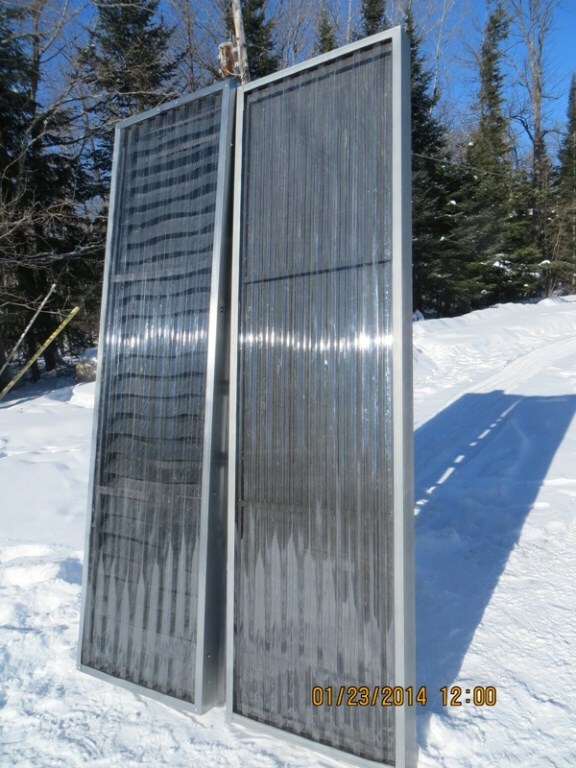 The 2 layer screen would lead by about 10 degrees over the thicker solar screen backpass as the temps rose but then they would stabilize at about the same temp when there was less sun or it went away. 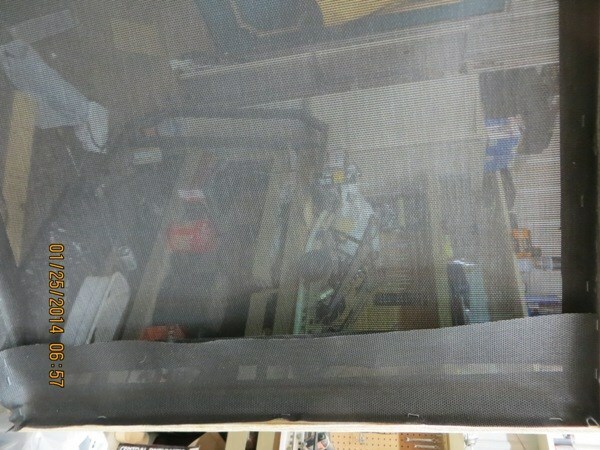 The 2 layer screen would then cool down much quicker also with temps about ten degrees less as it cooled back down. So the conclusion was they about equaled out in lower light or rapidly changing conditions. But... As I have seen in previous test and other solar screen test the solar screen collector gets quite a bit hotter than the other similar collectors in size. I was reading 134 against 119 when it was compared to the finned collector, Today in bright sunlight the 2 layer screen was 112 but the solar screen was 125 for the 15 minutes today I was home for lunch with slightly hazy skies. Today in bright sunlight the 2 layer screen was 112 but the solar screen was 125 for the 15 minutes today I was home for lunch with slightly hazy skies. Boy did I get this wrong, it turns out the higher output was the 2 layer screen, I mixed them up when I moved them and in my haste I expected a higher output from the backpass and thought it was the one on the left. Since there was such a big difference I changed my modification, (added bigger and better spacer to the end gap). I think the spacer was pushing it too close to the glazing and restricting flow. Once I did that the two outputs were within 5 degrees but the 2 layer screen was still the winner. The last thing I should make clear is this "backpass" is not really a backpass any more but has flow on both sides of the screen as I modified it and it increased the output a few post ago. These photos are from when I set it up Sunday afternoon and just left them for Monday because we should get some sun for a couple of days. The problem is it will be blowing in very cold outside air. Unless it is a bright sunny day and I keep the flow lower it may be difficult to get any good heat out. If I can set the output at 48 cfm with a 5-10 degree input I may get 60ish out, probably more like 45. But I could play with the flow and get some idea how they are comparing. I'm betting the solar screen backpass wins! 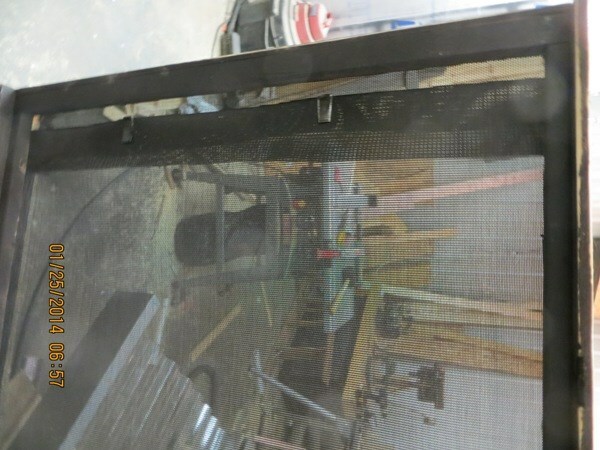 I was looking at your fan blower box(in your link) and seen the fan is not shroulded on the sides. I had the same fan in my attic at one time. It had really bad blow back through the sides. So if fully shroulded your cfm's should bump up abit. Wrap it in duct tape and test it. Thanks for the concern, I did not stick my face up to it but did not notice much air flowing out the side. Since I only need 96ish cfm for a 4X8, 1/2 that for a 2X8 and I can easily get 200 cfm per duct, I am not really concerned. I guess it could not hurt though so maybe I'll give it a shot. Dan, father of the "mother of all fans"